Bexhill United Football Club missed the chance to go top of the table as it was beaten on its longest trip of the season. The Pirates lost 1-0 away to fourth-placed Selsey in Southern Combination Football League Division One on Saturday. With fellow high-flyers Steyning Town and Alfold drawing with each other, Bexhill would have gone top had they won, but instead they dropped a place to third. Bexhill manager Ryan Light said: “It was just one of those really frustrating afternoons. Not for the want of trying, but we never really got out of second gear all afternoon. We’ve not experienced a game like it this year. Play swung from end to end rather like a basketball match during the first half, with neither team really able to exert control or mount sustained pressure. That said, Bexhill fashioned two decent opportunities in the first 15 minutes. Both of them fell to Jack McLean, the first following a lovely pass from Jack Shonk, but he didn’t get any real power on his shot on either occasion and both efforts were fairly comfortably saved. Light, who said McLean has been ‘magnificent for us this year’, felt that had those chances been converted, Bexhill would have gone on to win the game comfortably. Bexhill goalkeeper Dan Rose didn’t really have a save to make before the break, although Selsey’s big number nine Dan Bassil headed wide from a free kick. With the wind at their backs, Bexhill began the second half very well and enjoyed a bit of sustained pressure in the first 10 minutes. McLean was causing problems on the left and a couple of half-chances came and went. Bexhill’s pressure possibly led to their downfall as Selsey scored the only goal on the break in the 66th minute. As Craig McFarlane tried to get a block in, Ryan Morey produced a lovely back-heel to tee up Joe Bennett and he steered his shot into the far corner of the net. 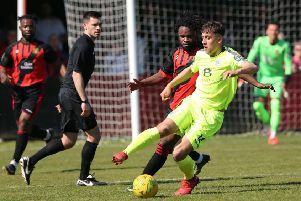 Although Bexhill huffed and puffed thereafter, they created little in the way of clearcut chances and you got the feeling it wasn’t going to be their day. The closest they came to an equaliser was an added time free kick from Sammy Bunn which clipped the top of the crossbar. Bexhill: Rose; Holden, McGuigan, McFarlane, Ottley; J. Bunn, Foster (Robertson), S. Bunn; Shonk, Greenall (McEniry), McLean. Southern Combination League Division One top half standings (played-points): 1 Alfold 23-55 (+40 goal difference), 2 Steyning Town 22-54 (+36), 3 BEXHILL UNITED 24-53 (+52), 4 Selsey 23-44 (+23), 5 AFC Varndeanians 22-43 (+26), 6 Littlehampton Town 23-34 (+5), 7 Hailsham Town 22-33 (+8), 8 Wick 22-31 (-6), 9 Seaford Town 24-30 (-7).